Holiday Gits project results in 450 gifts bags! Outerwear such as hats, scarves, socks and mittens for the people most vulnerable to cold Wisconsin winds. Many of these items were hand knit by our community: special thanks to Chai Point resident Lilian Rakita and all the Knitters on a Roll! Extra products for personal care, taking care of business, and expressing creativity, as well as candy, of course. THI provided Giving Chanukiot to eight synagogues with paper candles with gift suggestions with the age and gender of the gift recipients. Congregation members took a candle, purchased the items and brought them to the synagogues’ gift collection bins. The gifts were then gathered and prepared for distribution. A special thanks to Deborah O’Connor, Kira Berkoff, Cindy Cooper, Reenie Kavalar, Susan Ellman, and Susan Armour Sideman for efforts in making the Channukiot, sorting, and packing the gifts! We are especially appreciative of Project Chair Reesa Gottchalk’s hard work! A very special component of the Holiday Gift Program is the Holiday Party and Santa visit at Cathedral Center. 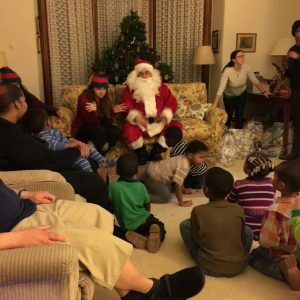 Thank you to our Santa Shapiro and family, who delivered smiles and gifts this year to over 50 children, mothers and fathers on December 24 adding magic to the evening event. The Jewish Community Center Chanukah Celebration provides an opportunity for Jewish children to help. This year, the youth filled festive bags with candy to make sure the holiday events had at least a spoonful of sugar. 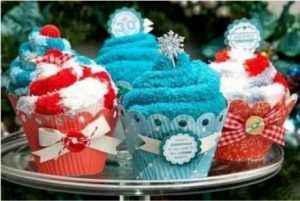 At Congregation Beth Israel Ner Tamid young people made sock cupcakes to include in children’s gift bags, and at Congregation Sinai, students help wrap toys. We are especially grateful to Moshe Katz and ATID properties for donating a vacant apartment to store, sort and bag gifts for distribution. In addition, THI is grateful to Laura Emir for purchasing gift bags. 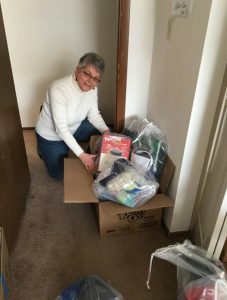 The bags kept items clean and safe while providing recipients with a good receptacle for laundry, personal use and transport for the new year. This was a truly community effort!